In Northern Europe there is a constant movement of spendthrifts who go to other countries to buy goods with lower taxes applied. The Swedes sail to Danmark for the “cheap” beer, while the Danes go to Germany for the “cheaper” beer. It’s pretty much a family tradition once or twice a year to pile into the car and drive to Germany to buy inexpensive things. This year was no exception, and we all made an outing to Flensborg for some shopping and strammer max, which after reading the wikipedia description, clears up why my cousins thought it was so funny that my grandfather kept declaring he wanted his strammer max. My cousin bought a leopard print shirt for $1, my dad bought some tennis balls, my grandpa bought some alcohol and my uncle Henrik calculated the savings made on each item in his head. 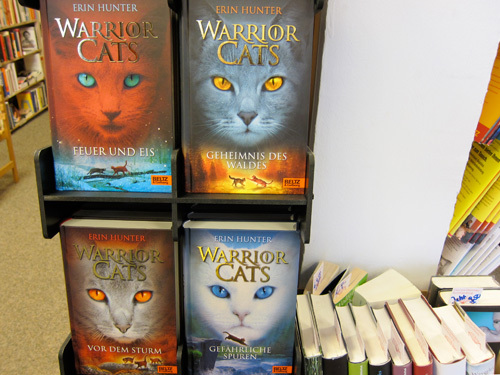 I didn’t buy anything, but I did see this book series entitled Warrior Cats. Uh, awesome? More proof that I really don't understand German taste. And that’s the whole truth. I bought a designer shirt that cost a fortune. Cute too.